Of course, David Wise’s soundtrack follows this over-the-top aesthetic. The result is music that’s almost the polar opposite of the NES original’s soundtrack. That earlier score effectively undermined action scoring stereotypes, full of jittery tension and frayed nerves. On the other hand, this Battletoads soundtrack is the most testosterone-driven score of the entire franchise. It makes for few stylistic surprises, but fittingly underscores the game’s cartoonish, exuberant mood. First track “Vulture – Robotic Rabble – Bonus Round” wastes no time in setting the course that this Battletoads soundtrack will take. With its speed metal-inspired staccato riffing, “Vulture – Robotic Rabble – Bonus Round” is easily the heaviest Battletoads track so far. It takes the hard rock sound of the SNES Battletoads & Double Dragon soundtrack and cranks up the intensity to take this score into metal territory. 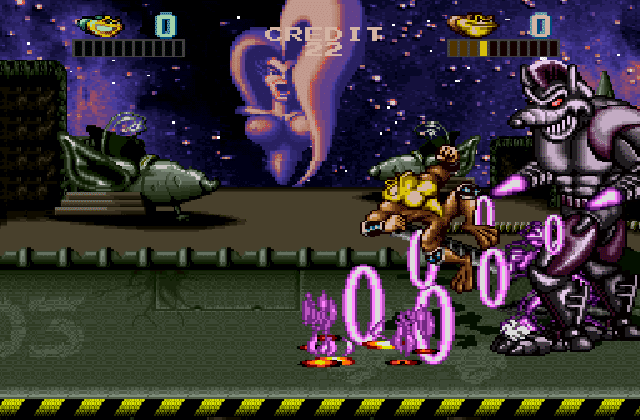 The guitar tone is hollower than on the SNES game, but “Vulture – Robotic Rabble – Bonus Round” is sufficiently varied and filled with enough indomitable energy that its fairly muddy sound matters little. And between the sledgehammer riffing, Wise still weaves in a handful of rousing guitar leads. “Big Blag’s Stronghold – Scores” is closer to the SNES Battletoads & Double Dragon’s melodic mid-tempo riffing. And indeed, Wise finds a memorable riff that he rides for all that it’s worth, right from the track’s beginning. Once the track’s rock-solid groove is firmly established, Wise finds the perfect moment to layer in anthemic synth fanfares. The synths bring flawlessly timed cinematic drama and raised-fists-to-the-sky defiance through their proud, catchy melody. “Boss 1” is a more straightforward metal track, setting a galloping rhythm section against howling guitar riffs. The drums’ constant push is merciless, but thankfully never turns monotonous (a sin “Boss 2” is unfortunately guilty of). Like Battletoads & Double Dragon, this Battletoads soundtrack is built on heavy rock guitars, with some genre mixes and experiments thrown in for good measure. 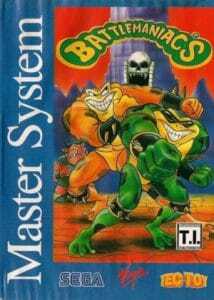 Their number is slightly larger than on Battletoads & Double Dragon, giving Battletoads are more colourful feel. “Arctic Caverns” is a less surprising affair than its NES counterpart of the same name, but the cue is still a playful and effective evocation of its location. Wise has great fun pitting hammering ten-ton riffs against chiming Christmas bells and the expected bouncy rhythms. Despite the jaunty synth melodies though, “Arctic Caverns” never turns into overt parody and remembers to simply keep rocking. 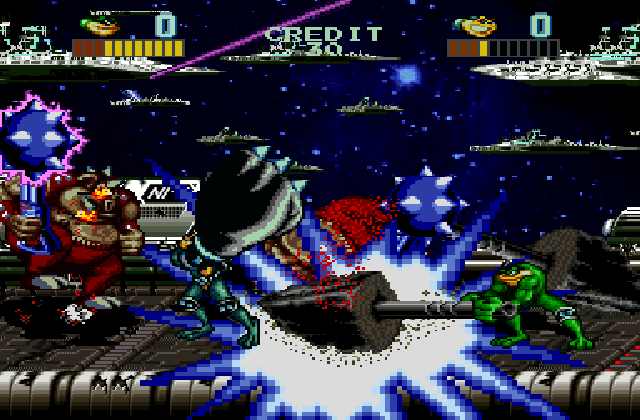 Other tracks that venture outside of the standard hard rock/metal template reprise parts of the Battletoads franchise’s musical heritage. “The Dark Queen’s Battleship” feels like a more focused take on the synth pop/rock/new jack swing melange that was Battletoads & Double Dragon’s “Roper”, with an insidiously catchy beat that despite little variation is strong enough to carry the entire track. “Hole” recalls the carefully paced mid-tempo orchestra/rock mix that the SNES Battletoads in Battlemaniacs soundtrack. However, “Hole” pulls off this approach much more successfully. The composition – despite its length – never meanders, with a clear sense of progression and constant rhythms. The latter help the music to develop an impressive sweep in steady, calm fashion as the claustrophobic atmosphere builds and builds and heavy melodies push the music forward, but only under great duress. It’s arguably a repetitive track, but for good reason, as the cue keeps hammering home its defiant melodies against increasing odds. To close the musical history of the Battletoads franchise – at least for now – Wise caps things off in a more celebratory mood than on previous Battletoads games. “Ending – Credits” opens with a beautifully layered brass fanfare, highlighting Wise’s impressive orchestral writing skills that would power several of Donkey Kong Country 2’s highlights. More intriguing still is the cue’s B section, an expansive violin melody with good amounts of light woodwind counterpoint. It’s a style of music that hasn’t been heard on any previous Battletoads score. 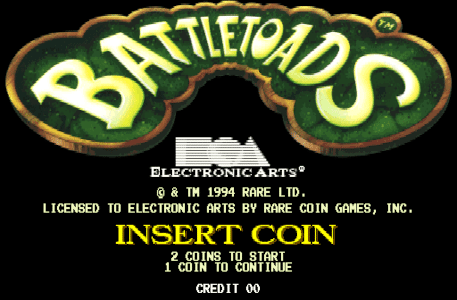 It’s fun to see that while in some ways this Battletoads soundtrack plays more by the rules than previous franchise scores, it keeps an appetite for musical surprises – maintaining a proud tradition that started with the 1991 NES original.